Comic books have time and again proven their worth as a way to educate and raise awareness about social issues such as AIDS and sexual abuse. While some publishers have used famous superheroes, others have opted to create their own defenders of truth, justice and bicycle safety... often with regrettable results. His Story: He was a drawing on a discarded piece of paper that transformed into a living, recycling superhero when subjected to strange chemicals in the city landfill. His Arch Enemy: A creepy goblin named, "Waste." His Story: He's Canadian, but instead of Wolverine claws he wears a yellow hard hat and a "pollutant-free ecobelt" that enables him to fly to ecological disaster zones. His Arch Enemy: Creatures from Planet Polluto, ruled by King Sewage III. Their Story: Their secret identities are the gym teacher and school nurse at Center City Middle School. Nutri-Man has super strength due to his healthy eating habits. Vita-Woman just lectures people a lot. 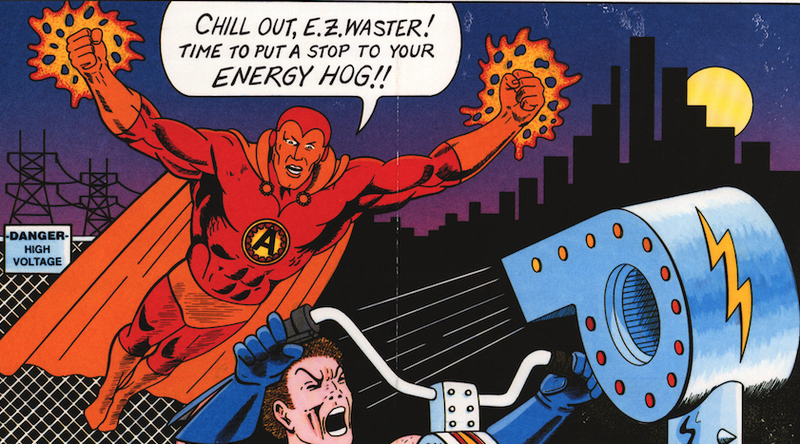 His Arch Enemies: Thermotron, Dr. Watt, Drip-Tacon and E.Z. Waster. His Story: He pops up uninvited, offering weird advice on bicycle safety (always walk your bike when there's a herd of buffalo in town). He carries a Captain America-type shield made from bicycle sprockets. Ironically, as the city's defender of bicycle safety, he is portrayed riding his own bike one-handed while wielding this heavy hunk of metal.